There are times I actually feel sorry for President Obama. He keeps getting blindsided by controversy. Usually, the controversy is exacerbated (if not directly caused) by his administration's bungling and/or opacity, but he should have learned by now that presidenting-while-black is all the excuse his detractors need. He needs to show some sense. 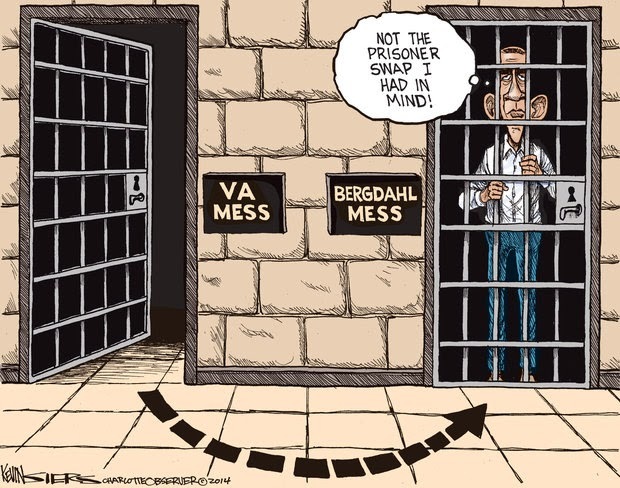 Still, this latest fiasco involving the swap of five Taliban prisoners being held in Gitmo for Sgt. Bowe Bergdahl is a bit over the line, even by this country's low standards. For an allegedly Christian nation, this place seems to be suffering a severe shortage in compassion. Ironically, Major Waltz was being more sensible than he realized when he noted that every American deserves to come home. EVERY American. If there are claims he deserted or collaborated, then let the military justice system investigate and try him. Here. And as for the kvetching about the release of the five Taliban prisoners as part of the deal, I say, "put a cork in it." I want all the prisoners and "detainees" released from that hell hole and Guantanamo Bay closed . ALL of them. It's time to return to our obligations under international law and to use diplomacy rather than bomb-carrying drones.